Remember Backaroo Banzai? yeah that one..with Peter Weller. At the end of the credits we were promised a Sequel and now nearly 30 years later the director of the original flick is still giving us hope. I believe MGM owns the theatrical rights. The other big insanity for ‘Buckaroo’ is that the paper trail for the rights is almost impossible to follow. Warner Bros. wants to do an adult animated version of ‘Buckaroo.’ PolyGram sold it to MGM as a big bundle — all these films move around. And then, finally, you’re sitting at a studio that you found out purchased part of someone’s library and they are reluctant to do anything with the title because they don’t know for a fact that David Begleman, who was a notorious double dealer, might not have sold the international rights in perpetuity to some guy in Bangkok. It’s been years since last I heard the name Buckaroo Banzai (remember the 80’s flic with Peter Weller?) and now he’s back…well at least as a comic book hero. 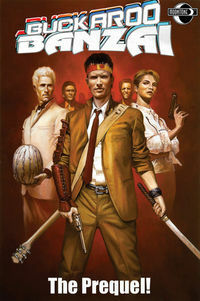 Moonstone which is a publisher i’ve never heard of before has picked up Buckaroo Banzai for this 2 issue micro series prequel. The art is very weak in this book and the first issue ends abruptly without even an ..To Be Continued.. when we’re at the final frame. The basics of the story are alright giving us insight into the man that Buckaroo is (prior to the movie) and his time challenge to figure out how to enter the eighth dimension while still being a rock star. If this publisher picked up some real art talent this comic would likely be far more appealing. As it is, I’ll likely buy the second issue just because but it is extremely unlikely that we will ever review another Moonstone title, the artwork is just that bad.